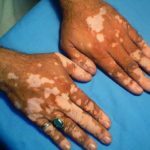 Also known as leucoderma, simply means white (leuco) skin (derma), i.e: a disorder where the skin loses its normal color. Due to destruction of the melanin (pigment), the normal skin starts loosing pigments from various parts of the skin, in a varying speed and extent. The typical appearance of Vitiligo is a milky white de-pigmented spot or spots. It may vary from a single white spot to multiple spots. The shape too is a variable. In some cases generalized de-pigmentation observed all over the body. It has a tendency to start as a single spot and gradually grow in size and number. It may present with a single or several spots on limbs or abdomen or back and then spreading to other parts of the body. 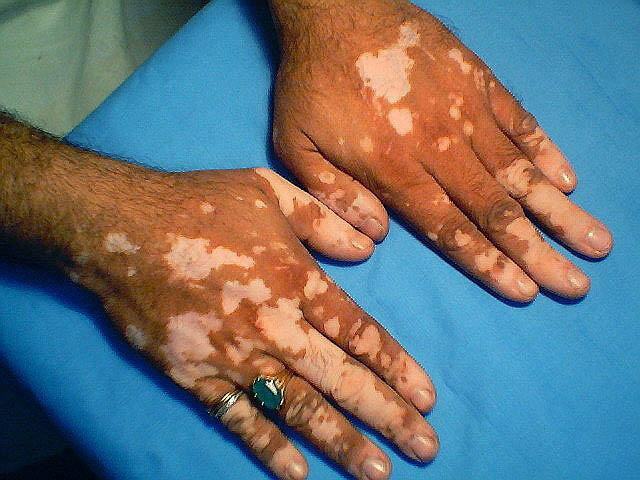 Treatment of vitiligo usually takes a long time. In certain cases treatment helps arrest the spread of de-pigmentation and may bring back the pigmentation in some cases. In majority of the cases, medical therapy only achieves stabilization of the spread but re-pigmentation does not occur. To achieve re-pigmentation where the vitiligo is stable and does not spread various dermato-surgical techniques are used. PUVA is an acronym for psoralen, a light-sensitizing medication thathelps enhance skin re-pigmentation. An oral or external application psoralen compound is given to the patient. The de-pigmented patch on his body is exposed to Ultraviolet-A (UVA) rays for a specific duration. Alternative to UVA is exposure to sun rays. The latter is known as PUVA SOL therapy. Treatment with UVB rays is another option. 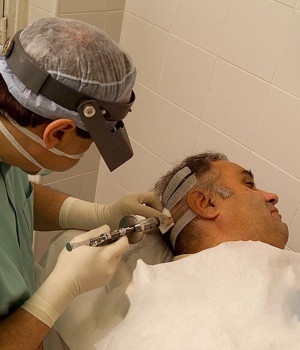 The most recent treatment is the use of Excimer laser. Different methods are available and selection of the appropriate surgical technique for the best results. Multiple thin grafts of 2 – 2.5 mm diameter are taken from the donor site by special punches and grafted on to the diseased area. Once the grafts are ‘taken up’ the patient is advised to take PUVA or PUVA SOL. Re pigmentation occurs in 3 – 6 months and good cosmetic result is obtained. 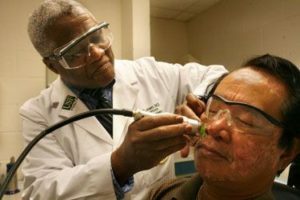 An untra thin skin graft consisting of epidermis is grafted onto the laser ablated part of stable vitiligo. The graft falls off in a week to 10 days but there takes place a cellular uptake of melanocytes on to the abraded skin which gradually starts pigmenting, it takes 2 – 3 months for the pigmentation to merge and match with the surrounding skin color. A prolonged suction (negative pressure) is applied to the donor site this raises a large bleb and a thin graft containing only the epidermis is obtained. This is grafted on to the dermabraded recipient surface. This technique is time consuming but gives good cosmetic results. Melanocytes are cultured in artificial culture media. The de-pigmented recipient site is dermabraded or laser ablated and the melanocyte suspension is applied to it. The area is covered with a collagen dressing and immobilized. Large areas can be covered with this method and excellent cosmetic results obtained.